Barry Howard & One Client....for a week in wilderness and/or mountain country to learn technical skills, and enjoy the 'journey'. There's been an increasing demand over the past three years or so for individual and small group guiding across wild country and mountain either for recreation, therapy, or as a masterclass to learn the art and science of 'being out'. Much of what I've done with clients regarding this type of activity has been in Scotland such as Assynt or The Southern Uplands - but can take place anywhere the environment has an aspect of challenge - even Ashdown Forest in the winter of 2013 was severe enough to challenge clients. 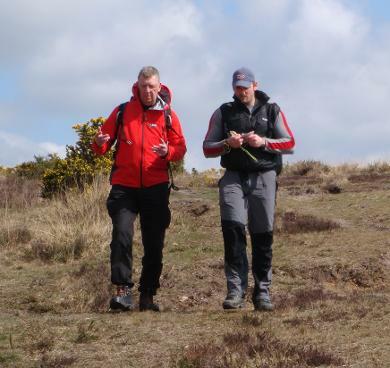 These one-to-one or small-group sessions can be of any duration and can include a small or wide variety of content eg micro navigation, emergency procedures, remote campcraft and backpacking, steep ground work, or some aspect of the natural environment. Be aware that if you are the sort of person who relishes being with an Instructor-Guide 24/7 then, in mountainous or hill-country the demands upon you are considerable. However the speed at which clients pick up skills is also considerable because one's immersed in the task with total, unique, and unbridled access to the Instructor. And it works. No two days are the same and the pace of learning is fast and quite intense (apparently!). Assynt courses are based near Lochinver, and southern-Scotland courses near Kelso. All other courses are flexible in their location-base eg Dartmoor somewhere around Ivybridge or Chagford, and Snowdonia near Beddgelert. Clients normally find their own way to the venue; accommodation is usually but not exclusively small hotel or B&B, occasionally a Youth Hostel dependent upon the client's requirements. 'Small Group' is usually four or less. Be aware that distance to some locations is great: it's almost 700 miles to the Lochinver venue with no rail connection beyond Dingwall or Kyle of Lochalsh; and it's a two day journey to get there. Clients have reported though that it's all part of the adventure. Norway, Iceland, and Sweden-based courses are available, as are since 2015, bespoke wilderness courses in the Outer Hebrides. If you want a challenging, memorable, and educational and/or technical few days or a week or more, where your skills-base is substantially upgraded, and you have a passion for 'being out' in wilderness then get in touch to create your bespoke course. ABOVE: All volunteers 'under my wing' for a weekend - and in preparation for trekking across Dartmoor sometime in 2017/18; do they know what they are letting themselves in for?! BELOW : Navigation one-to-one masterclass pre ML. BELOW: With Chris Ryan in Gleann Mhiabhaig, North Harris, Outer Hebrides. Sept. '14. BELOW: Winter Masterclass: backpacking the summits of the Northern Fells in the Lake District: -8 deg C, and -17 deg C windchill. Summit camp on Carrock Fell looking south to Bowscale Tarn (left), the edge of Bannerdale Crags (which we did the next day) just right of centre, and the very edge of Blencathra extreme right. January '15. ABOVE: Dartmoor May '14 in visibility of less than 50 metres - all day. So we compassed each leg of the whole route across about 6 miles; the client was tested quite severely - and had to learn very quickly to use the compass and walk on a bearing. He did well. There's no substitute for the real thing. BELOW: with a client winter '14 in southern Scotland: the first snow free New Year for 71 years but a windchill way below freezing - and a 60mph sleet storm a few days later. BELOW: Route building out on the extremely remote Mealasta coast. Solo. Sept 2014. BELOW: On High Pike early morning. Taking on board all the skills to successfully manage a multi-day backpack in winter at over 650m is not for the weak of spirit! January '15.